F&F Productions will equip three of its GTX series mobile production units with the latest version of EVS’s VIA technology, as it continues its push into production of Full HD 1080p and UHD-4K HDR content. EVS XT-VIA and XS-VIA production servers and the newly announced XNet-VIA Ethernet-based live-media–sharing network will help future-proof the units so that they can transition to IP-based signal transport in the future because VIA supports industry IP standards like ST 2110 and NMOS. 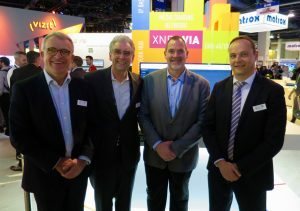 (l-to-r) Vincent Werbrouck and Jay Shinn of EVS; Marc Orgera of F&F Productions; and Quentin Grutman of EVS at NAB 2019. As part of the deal, which was agreed at the 2019 NAB Show, F&F Productions will also upgrade its existing fleet of EVS live-production servers to the latest Multicam 16.00 operating system. This will significantly increase the internal bandwidth of one of the largest inventories of XT series servers in North America, enabling F&F Productions to deliver expanded capabilities and meet the demands of live productions in higher resolutions. This important investment gives F&F Productions more capacity and greater flexibility to produce content in multiple formats, including Full HD 1080p, UHD-4K, and HDR, as well as enabling the upscaling of 1080p content to UHD-4K for playout. The XT-VIA servers will be used to replay, edit, and produce all content going into the mobile units, and the XS-VIA servers record multiple audio and video feeds, providing instant control and multiple channels of playback operations. They are all linked to XNet-VIA, which gives the LSM operators in the three EVS VIA-powered GTX mobile units three times the bandwidth of EVS’s legacy SDTI-based network. This will allow them to move high-resolution recorded media between the XT-VIA and XS-VIA production servers at greater speeds. Quentin Grutman, SVP, The Americas, EVS, says that EVS sees real momentum building for delivering productions in higher resolutions and that customers are recognizing the potential of the VIA suite of products in addressing new demands involved in UHD-4K, 1080p, and HDR, as well as IP-based workflows. “Having a facilities provider like F&F Productions commit to our latest technology shows we are central to the growth of this movement,” he adds. The XT-VIA and XS-VIA production servers — along with XNet-VIA and EVS’s other industry-leading technology that connects creative teams, reduces technical demands, and enables efficient live production workflows in any environment — will be on display on EVS’s booth (SL3816) throughout the 2019 NAB Show.